The San Francisco Chronicle has been running a Rent-A-Grandma series to connect people in the Bay Area. The latest entry is from today and contains the tale of a woman who lost her Grandmother this past year, and then lost her Grandmother's home city of New Orleans. She wanted to find someone to help her rediscover the cooking of her Grandmother. So on a recent October day that unfolded in waves of heat and recollections of New Orleans, Muffelletto found herself over the stove at the Vallejo home of Gary Gentry, Maudice and Bill's son, to apprentice at the side of three teachers. Gary would teach gumbo; Bill, baked goods; and Maudice, her incomparable fried chicken. The menu stretched from gumbo and fried chicken to collard greens, crowder peas (a variety of shelled beans), smothered steak, cornbread, sweet potato pie and pound cake, because when you start a menu with fried chicken, you don't stop until all of Grandma's best dishes are put on the table. The eaters, who began straggling in by late afternoon, ranged from sisters and brothers-in-law to grandchildren to great-grandchildren to first and second cousins. When you cook like this, it's for family. 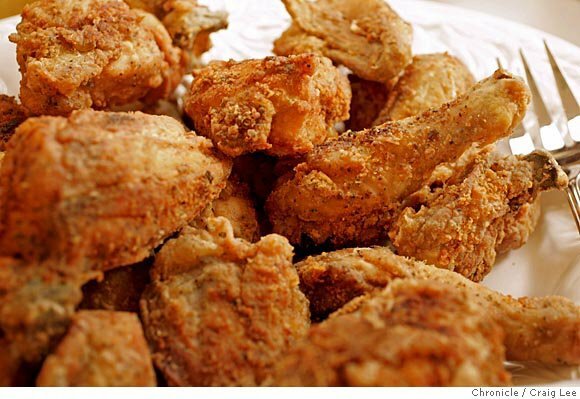 The full recipes of all the dishes is in the article as well, including that great-looking fried chicken. Can you pair Japanese with Wine?